Site description: The Rwenzori region covers an area of 13,970 km² [UBOS,2005] in the west of Uganda.. The region has a tropical bimodal climate within which there exists a wide variation of climatic conditions including wet lowland, dry savanna, wet mountain forest and alpine forest. Land use is divided over: agricultural/grassland and built-up areas, water bodies and wetlands, and natural woodlands and plantations (of this 46% is Tropical High Forest (THF)). The region is flanked by four protected national parks. Pressures: Uganda has experienced very rapid population growth for several decades. A principal cause of habitat conversion is human population pressure. Over-exploitation of resources, which also includes over-hunting and harvesting, depletes Uganda’s stock of animal and plant resources. Poor agricultural practices, such as over-stocking of rangelands and cultivation on steep slopes, contribute to erosion and siltation of water bodies, thereby altering ecosystems and species composition. Inappropriate policies, such as the agriculture policy of modernization, implicitly encourage monocultural and agrochemical-intensive farming systems that contribute to loss of genetic diversity through over-specialization and pollution of sub-soil ecosystems. Exotic species can out-compete native species and replace them in the system, thus reducing the species diversity, lowering genetic diversity, and increasing the homogeneity of the landscape. Although useful to meet short terms needs for timber, they could threaten the survival of native species if there are no guidelines for private tree planting. Pollution from the use of pesticides associated with cotton production and malaria prevention pose a potential threat if not regulated by guidelines. While the level of industrialization in Uganda is still very low, the industries that are in operation are significant sources of pollution. Recently there has been severe drought and evidence of change in glacial extent (area) on the Rwenzoris Mountains for the period 1906 to 2003 (Mileham et al. in prep.). If current trends in global warming persist, ice cover remaining on three of the six main mountains of the Rwenzoris will disappear altogether by 2023 (Mileham et al). As the climate warms, the various Afroalpine vegetation zones can be expected to move to progressively higher altitudes and consequently to decline in area (Pomeroy & Tushabe 2004). The disappearance of ice cover will mean reduced water flow in the streams downstream which feed into lakes George and Edward, and Semliki River discharging water into Lake Albert and ultimately into the Nile. The biodiversity and tourism potential of the Rwenzori region will also be affected. Stakeholders: Mountains of the Moon University is strongly embedded in the Rwenzori Region and thus has contacts with governmental, civil society and private actors in the region. 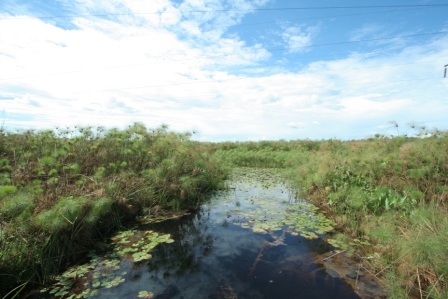 National Authorities involved in the region are the Uganda Wildlife Authority, the National Forest Authority, the National Environment Management Authority, and the Ministry of Water and Environment. At districts levels the District Environment Officers are key in the management of natural resources as well as the National Agricultural Advisory Services. International NGOs active in the Rwenzori Region are WWF, PROTOS, SNV, CARE. MMU furthermore collaborates with a number of national and local NGOs to concretize the link with the local communities. These include ARCOS, Nature Uganda, Tooro Botanical Gardens, Kabarole Research and resource Center , Sustainable Agriculture Training NETwork, Joint Effort Sustainable Environment. Other research institutions maintaing activities in the Rwenzori region are the National Agriculture Research Organism and Makere University Biological Field Station. Case study focus: This proposed case study will focus on Payment for Environment Services (PES) approaches for improved soil management and ecosystem integrity. AFROMAISON will analyse and evaluate existing PES forestry initiatives in selected areas in the region for their impact both in ecological terms but also with respect to their ability to link the needs of the ecosystem to human wellbeing, and to do so in a cost-effective manner. This research will inform the development of a set of PES tools for application in forest management, agro-forestry and reforestation projects in denuded areas with high population pressures. The tools will be developed with particular reference to: a) effective community incentivisation to replant and maintain a commitment to the replanted by investigating ways how income can be derived beyond initial tree planting? b) Cost efficiency, PES schemes must make economic sense for funders and implementers c) Indigenisation and maintaining biodiversity or how communities/farmers can be incentivised to plant indigenous species and contribute to biodiversity? And d) Food Security or how effective soil management through PES schemes can be balanced against the pressing issue of food security?